Francine Smith and Malia Young-Brohn!! You and your guests will enjoy the Effervescent Francine and the Dynamic Malia. Labels: Bocannaco, cbd oil, endocannabinoid system. Interesting article below from the ACS website; albeit a bit out of date and definitely not current with CBD information, nonetheless it is definitive regarding the cannabis sativa plant having a palliative effect on cancer. That is why it is referenced here. It was on my mind because of a conversation yesterday with a lady on the other side of the US. Her husband is the friend of a Bocannaco distributor and he encouraged her to call me regarding CBD oil. Her husband was diagnosed last September with Stage 4 aggressive cancers that had metastasized to several places in his body. His doctors prescribed chemo, radiation, and the whole arsenal, but would not predict an encouraging outcome, so he and his wife refused to go that route, choosing instead to pursue alternative medicines and treatments that would not be so hard on his body. I could not jot down all the things that they have tried to date, and didn't understand what they are currently trying, but marijuana (THC heavy) is part of his regimen. She said he hates the stoned feeling, plus he has recently begun having pain where he didn't have pain before. She described the paste he is using as 'like tar'. Did I recommend doc's 1500mg CBD oil? it won't interfere with what he is currently doing. As the ACS mentions on its website, much more research in this area is needed. To which we add: Sooner rather than later! Different compounds in marijuana have different actions in the human body. For example, delta-9-tetrahydrocannabinol (THC) seems to cause the "high" reported by marijuana users, and also can help relieve pain and nausea, reduce inflammation, and can act as an antioxidant. Cannabidiol (CBD) can help treat seizures, can reduce anxiety and paranoia, and can counteract the "high" caused by THC. "Great call tonight. Good stories and looking forward to more. This is an excellent product. It’s been very effective for my brother who had a stroke a couple of years ago. I watched a special on cannabis the miracle cure. ... A lot of really good stories and I have asthma which benefits from the anti inflammatory nature of the plant. I’m super excited about this venture because it is something that I believe in. I’m looking forward to meeting you and Mike and the rest of the team! People who are familiar with Doc's formula have only good things to say about it; and that makes me smile. Because if there's one thing we know for sure it is that people will do for love what they will not do for money. And when you find something that works for you, that delivers what it promises (in this case, 1000 mg. CBD/bottle), you want to share it with people you love and care about. Notice the note above: the first person Malia mentions is her brother; herself secondarily. When you have a product that brings relief to your loved ones, everything about the plan by which we market the product just happens naturally. 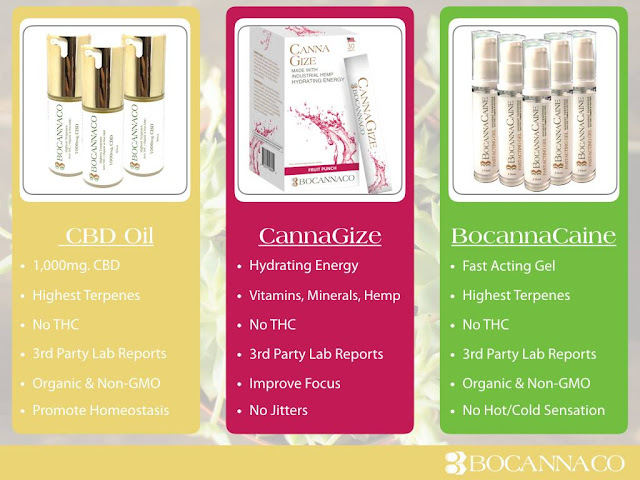 WHY THE BOCANNACO MARKETING PLAN? We often get asked why we believe in marketing through a network concept. 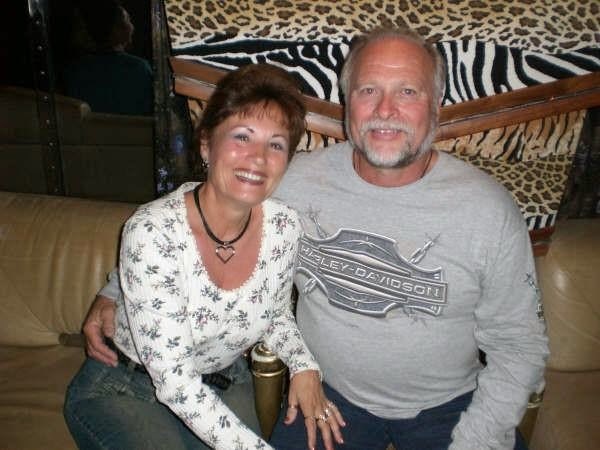 Let me tell you my story: my husband Mike and I owned health clubs and I was in charge of sales. I spent thousands of dollars on print, radio and tv ads; only to find that most of those dollars were wasted. The most effective ad campaigns I ever did were such things as mountain bike giveaways to the member who brought in the most guests in a month. After we sold our clubs, I attended a business presentation for a telephone company that was competing with ATT, MCI and Sprint by using a network marketing pay plan. I watched as the comp plan was explained and was struck by the sheer brilliance: that company would pay me to get customers for it, and overrides if I would get others to get customers for it. I sat there and said to myself: "This guy is not paying an advertising dime to anyone until he is brought customers! If I had done that in the health club business we'd have been HUGE." And so began our nwm experience. For a new company to bring a new product to the marketplace effectively, there is no better format than through a compensation plan where what is (essentially) an advertising budget is structured into paying interested distributors for what is (essentially) their word-of-mouth advertising. 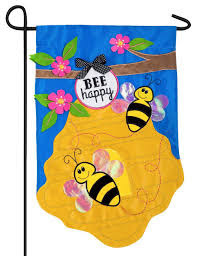 And the super-great thing about Bocannaco is that those distributors can participate in residual income as their happy personal customers and the happy customers of their team re-order and re-order and share with new customers and love the new products that doc invents and order those, and Bocannaco just hums along like a bee hive! Since meeting Dr. Lawrence we have learned that there is often a big difference between what a label says and what's really inside. We have also learned the value of interpreting what labels say! That is a big reason the weekly calls feature people eager to share what they have found with doc's oil. Of course everyone is different and we are not a drug, pharmaceutical, or medical company: we don't diagnose or prescribe. then you should try a bottle of Bocannaco and see if it helps you or not. That's what it boils down to: Give our real, honest CBD oil a try and see what your story is. By the way, Casey shared the story of a school teacher who had used another cbd oil for a joint condition and who subsequently failed a drug test. Casey said that the fact that Bocannaco has ZERO THC and therefore poses no drug test danger is one of the first and foremost things that he shares with people. Do you need forms or video links or BP? Contact whoever gave you this blog, or barblammons@gmail.com for info. Busy, busy week! Welcome to all the new Founders and Distributors -- things are really moving. 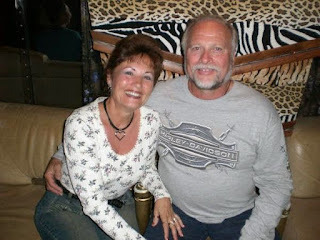 Most of you have been keeping up with Kathleen and her brother Michael and his incredible improvement with doc's oil. Mike filmed a short video interview with Kathleen and Michael....we are not going to post this to social media or website (thank an attorney)... but if you'd like the clip emailed to you, text Mike. Today was the FIRST DAY that Mike went to the mailbox and retrieved envelopes of Founders and Distributors! It is so exciting! If you want to be first in your state better hurry: we got a call today from a sweet lady who tracked us down from Texas. 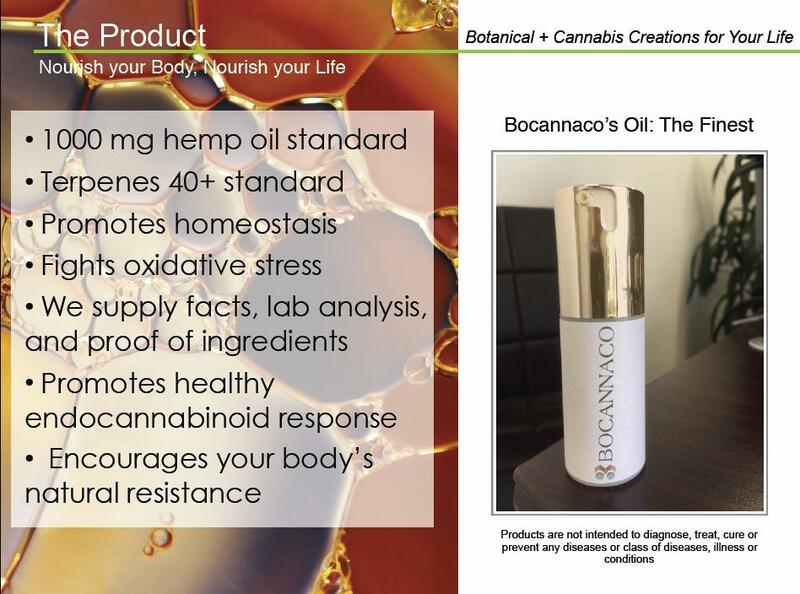 She had heard someone discussing Bocannaco (they were not interested in being part of it but were just mentioning the existence of this new company) -- well, she was interested and she took it upon herself to look us up! Guess what: as Mike was sharing with her the story of how we got involved with Dr. Lawrence she stopped him. "Is that Dr. Lawrence in Torrance, CA?" She starts screaming -- turns out she used to call on Doc when she was a pharmaceutical rep in CA! What a small world. She sounds awesome -- and she was worried that she was 'too late' to be a Founder. There's still a little room -- but it's filling daily. By the way, she said that in the pharmaceutical industry, all the buzz is about hemp and hemp products. Had our weekly update call with David and Dr. and Doc said four people had called him this morning wanting to be a Founder. Will fill you in on more info on Monday. 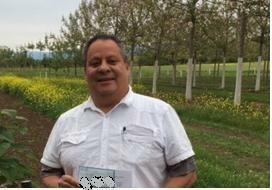 Yesterday Bocannaco Distributor and Founders Bonus Pool Member Jeff Verdugo came down from the mountains bearing an envelope of paperwork and checks of his starting Bocannaco Team! He'll be back Friday with another envelope. Jeff has a back injury and his first bottle of Bocannaco oil brought such relief that he is in full 'let's share this with everybody!' mode. The new Bocannaco Opportunity video by David and Anthony is a big hit! Feedback has been plentiful and it's all "Thanks!" and Thumbs up! If you did not get the link and password, text whoever gave you this website and they will be happy to share. Spring is shaping up to be memorable for many things. But we believe that 2018 will be a standout year for one thing: bringing Dr. Lawrence's incredible work ethic, scientific prowess and inventive formulations within the reach of ordinary people, through the vehicle of Bocannaco. If you haven't tried it yet, just wait till you get your hands on a bottle. Then you'll see why Bocannaco. The first Bocannaco Founder Bonus Pool Member and First Distributor !! Great call last night. Dr. Lawrence was a big hit with everyone and so glad that a bunch of you got to hear from him direct about why Bocannaco is the 'real deal'. The first Bocannaco Founder Bonus Pool Member and First Distributor submitted their paperwork this morning: Welcome on board Warren and Kathleen Pannett! The beginning is now and what an exciting endeavor to be part of! David sent a link just now to the Bocannaco Opportunity video: it is Awesome! It should post for you to view and share with others shortly. David's videos are an incredibly helpful tool to help you market your business quickly and powerfully. At only 6 minutes long, anybody can make time to give it a look. One of the bumps we have dealt with involved not using the term CBD on our website and in materials (don't ask -- political mumbojumbo). But that has been cleared away by the President and after time spent scrubbing those 3 letters from all our documents, we now find it is ok to use! I bring this up because if you think we're a bit slow getting all up and running, it is partly due to such hair-splitting as this. (Sigh.) But with patience and prayer everything is coming together! Thanks for your patience and encouragement -- and prayers! By the way, the Incredible and Indefatigable John Lambeth (you've been hearing him on the calls) called today and asked if we had business cards and brochures ready to go. Mike told him 'No'. He asked who was working on them. Mike said 'No one'. Well, it turns out John's wife is a graphic designer and volunteered to design a few items and (after approval by the attorney) post the templates so anyone can download and use. How generous! That is typical of the grassroots group effort this project has been from the start. We are amazed, humbled, and SO GRATEFUL for the sharing of talent you guys bring. And big hugs to the Lambeths! Meet Dr. L. Monday night! Monday nite call our very special guest will be Bocannaco's own Dr. Robert Lawrence. questions from you folks. Please submit in advance in the interests of time. And invite your guests to join in -- we wish you could each meet Dr. Lawrence in person, but this will be the next best thing! And there might be another newsy tidbit or two announced, so GET READY!